Getting up in front of an audience is difficult. Making a lasting impression is even harder. There is no single formula for a great presentation. There is no magic pill to turn you into a great speaker overnight. Don’t stress. 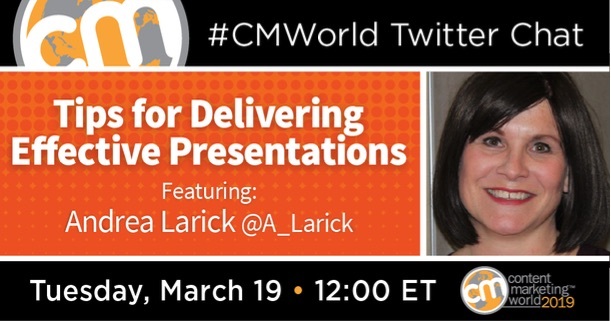 This week’s #CMWorld Twitter chat was filled with tips that will help you in the boardroom or on a stage. Our special guest Andrea Larick has seen it all. She oversees both Content Marketing World and ContentTECH Summit presentations. Based on her experiences, she shared key principles on how to become a better speaker. The following is a look at her conversation with our community. Want more? Our Twitter Moment includes more from the Q&A. How do you fit your big idea into a presentation without overwhelming or boring your audience? How should you structure your talk? Everyone has a different presentation style. Do you take the time to rehearse? Or do you deliver something impromptu? I tend to prefer to winging it! How has public speaking strengthened your role as a content marketer? Let us know in the comments below. Meet Andrea and see the group of speakers she has lined up when you attend Content Marketing World 2019. Register now with code SM100 to save $100 off Early Bird prices.